We started off our day on Cat Island with breakfast from the Blue Bird Cafe. Grits, sausage, eggs, orange juice, and tea. Delicious. Kris and I retrieved the bikes from the boat to take up the hill to the Hermitage, a retreat and home built by an architect priest in the 1920s. More on that in the next blog (there are just too many photos to share of the beautiful place). Carol, Gary and Spinny met us at the Hermitage with a rental car. We spent the remainder of the day motoring over the roads of Cat Island. We harvested coconuts, bought some straw works from a local craftswoman, visited old plantation ruins near Port Howe on the SE side of the island, and checked out the marina over in Hawks Nest on the SW side of the island. Gary made some fishing friends there and landed a coupe more dolphins for us. Apparently his friends had had a very good fishing trip themselves earlier that day. Spinny made some dog friends too. Kris and I looked at the airplanes parked at the airport in Hawks Nest. A Super Cub on floats, a double propped Piper, and a large amphibian. We’ll probably dock here tomorrow and spend a little more time here. Carol and Gray really like the internet and bar service. Forgotten conch shells outside of the Blue Bird Cafe. Mailboat at the government dock. He sure is coo-coo for them. Spinnty and the plantation at Port Howe. Gary searches for conch in the shallows near the plantation. Why was I put in charge of carrying the fish? I’m chalked to the ground! I cannot move! Airplanes lined up by the runway. Today we sailed over to Conception Island. The sail was a nice one, but a bit rolly. On the way over Gary spotted an ice rainbow in the sky. Conception island is beautiful. It’s surrounded by numerous reefs, both in deep and shallow water. 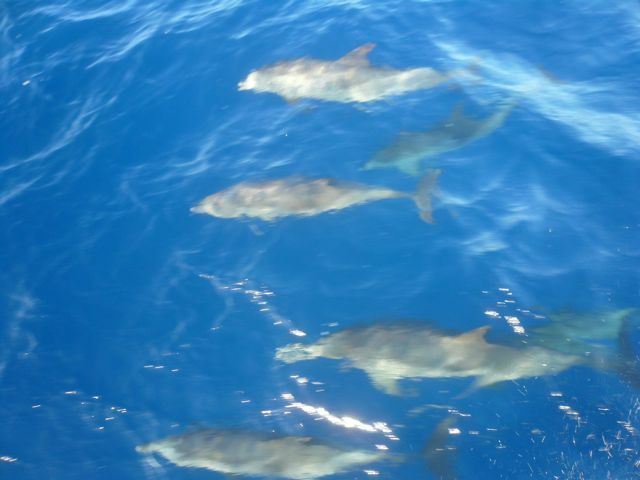 As we came in, we spotted a couple of dolphins off the starboard bow, fishing by some of the deeper reefs. We paired off and took dingy rides around the island. Gary and Carol went off first with Spinny, so Kris and I stayed with the boat. We donned our bathing suits and jumped in the ocean for a bit of a swim. When they got back, Gary and Carol told us they’d gone over to a few rocks nearby that were covered in crabs. They also reported that the reefs around it housed many colorful fish. Kris and I explored the crab rock, then sped around to the southern part of the island where we saw an osprey high upon a clifftop nest. 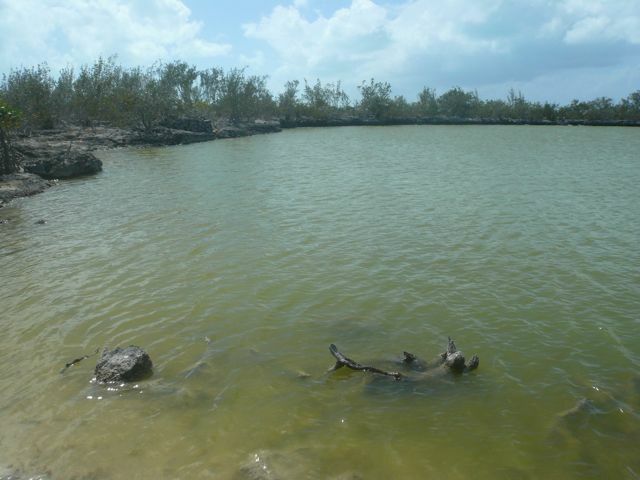 We also found the entrance to the mangrove outlines shores of the inner island waterways. The tide was too low, however, to venture in. We will have to go another day. We waited to explore the inner island until around noon, only to discover that we’d gotten the tides mixed up somehow. Again, it was too low to venture in, and wouldn’t be high enough to enter until too close to sundown for our comfort. Kris and Gary worked on scrubbing down the bottom of the boat. Carol and I cleaned and straightened up in the cabin. Later, Kris, Carol, and I explored crab rock and the reefs around it further. I saw a squid hanging around one of the coral heads, and an eels poking it’s head out of another. A rainbow appeared on the horizon, created by a distant rain cloud. Spinny went with Kris and I later to explore the shoreline and to play a game of fetch the coconut. Spinny is quite coo-coo for coconuts! We will try exploring the mangrove center of the island early tomorrow morning before we head out for Cat Island. The osprey atop her nest. We took the boat up to Calabash Bay on the northwest shore of Long Island. This will be a better jumping point to go up to Conception Island tomorrow. 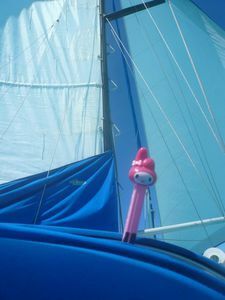 The sail was good, though a little slow as we were downwind the whole way. We put out the mizzen, main, and genoa. 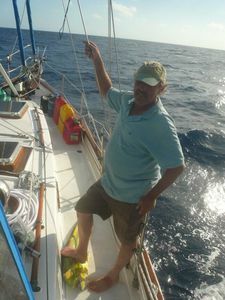 Kris and I set up the whisker pole for the genoa as well. An old friend showed up to help us. She said she’d left Santa and the North Pole. She was too jealous of the other Pez dispensers Santa kept having his elves create. 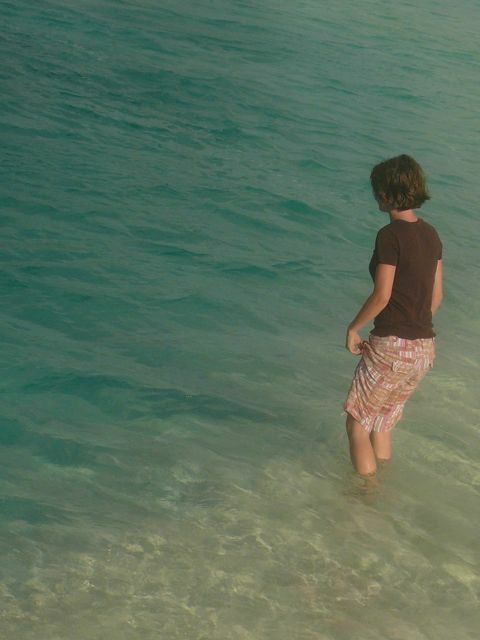 Not to mention she missed the thrill of the sea. Everything is frozen solid up by Christmastown. Now she can party all night at the beach bars and sun all day, working on her tan. So much better than freezing up there in the land of the midnight sun! Brrr! Calabash had a strong surge rolling through the waters. We were rocking the night away in our anchorage. To celebrate the successful sail, I put together a chocolate banana pie. I hope the sailing is good tomorrow, and perhaps not so downwind. Spinny and Kris are a bunch of nuts! Another Vagabond! She looks nice in black. The genoa is whisker poled. A fellow sailor sailing our way. This is an intermediate post before I put up the entries for the past few days. 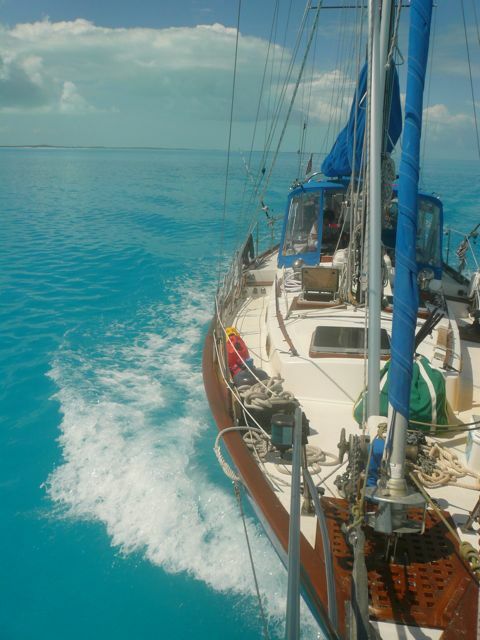 Just letting you know that we are all safe and sound at the Marina at Emerald Bay on Great Exuma. Carol will be leaving us on Tuesday to fly back up to Ohio and the business. Kris, Gary, Spinny and I will move on for more adventures until her return. Until Tuesday rolls around, we will be staying in the Marina, catching up on internet, chatting with the cruisers here, and hopefully meeting up with the Mounts who are still anchored off of Stocking Island, up by George Town. Look for more blog posts soon! There are dolphins, fishing stories, beautiful scenery, architecture, and much more coming up soon. Today was a relatively uneventful day. The late morning was spent at the Long Island Breeze resort, sending emails and blogging with the internet available there. I developed a bad headache as the day progressed, so I stayed on the boat while Kris and Gary went out to explore the waters around the western shore over here. They dingied over a few more blue holes, but the high winds and choppy waves had them wet and beat by the time they got back. The rest of the chilly windy night we spent watching movies. Our wind turbine has kept the battery and full or nearly full charge in these higher, consistent winds. Now we’re back here at Long Island Breeze, doing laundry, eating lunch, and interneting. This is really a very nice resort. 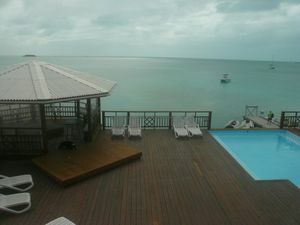 There’s a pool on the restaurant deck overlooking the ocean, lunch and dinner, internet, laundry, and showers at $5 a piece. There are a couple of cottages here to rent as well which look to be very nice accommodations if you do not have a boat to sail over. I highly recommend stopping by if you are ever in the area. Looks like we’ll be here for the rest of the day, and possibly leave for another part of Long Island tomorrow. We’ll probably head up to Conception Island sometime around Sunday or Monday, depending on the weather. The view from the deck at Long Island Breeze Resort. We are staying in our anchorage here outside of Salt Pond, Long Island until the heavy winds driving out of the NE have settled down. Because we were definitely not leaving today, and probably not even tomorrow, we decided to rent a car from Fox Auto for 24 hours. And so, we went touring around Long Island. First stop: Stella Maris. The main attraction? A blue hole that looked to be right in town, according to the charts. However, when we began driving down the roads that would lead us to the blue hole, we found them to be overgrown with weeds and bushes. We walked the rest of the way to the blue hole, which actually turned out to be more of a brown hole, or an exceptionally deep pond complete with ducks. Ah well, at least we found it! The rest of Stella Maris is a bit sparse. The Stella Maris Marina sits on the eastern shore of the island. The channel leading into the marina waters is a bit shallow, more practical for a boat with a 5ft or less draft than ours with 6ft. The marina was small but pleasant. However, there isn’t too much near by at all, a just a bar and a small store. On the western shore of Stella Maris was a little beach home neighborhood. 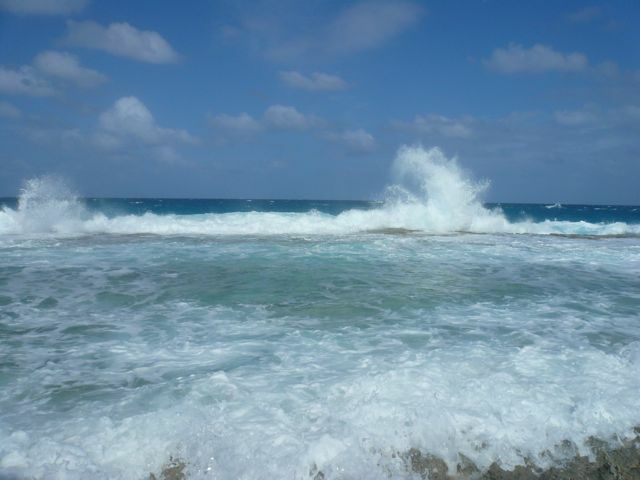 It was very pleasant and well kept, with a couple stores, a restaurant and bar, and easy beach access to a sea that we found tossing and turning, turbulent waves crashing on shore, driven by the high winds rolling in. Next Stop: Deans Blue Hole. This is the deepest blue hole in the world at over 600ft. The hole is located on the western shore of the island, just south of Hamilton and north of Clarence Town. There are signs directing you to the hole from the Queens Highway. Be careful when you drive down the bumpy roads. You will abruptly come upon the beach after a turn at the end of the road. 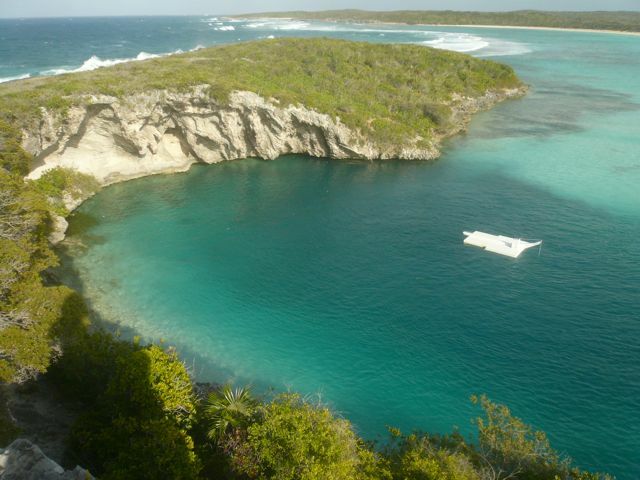 The blue hole is just around the corner, surrounded on one side by a circle of cliffs. A rope ladder on the far end seems to indicate that some people like to jump into the hole from the cliffside and then climb back up to do it again. A diving platform sits in the middle. I walked to the edge of the blue hole, just the chilly winds and occasional cool rain didn’t have me in the mood for a swim. Gary hopped on in for a snorkel. However, with the winds churning the waters on the western shore, you could not even see the steep sides of the hole, and so it just looked like a deep sand pit. Still, the blue hole was breathtaking. A deep dark hole in the water, a tunnel to caves connecting other deep holes across the island. A gateway to a network of of tunnels carved in the crust of the Earth by thousands of years of erosion, tunnels that shroud themselves and their mysteries in inky blackness. And I stood at the mouth of it. Third Stop: Clarence Town. The town sits on the west shore of the island. Two Turtles Marina is located near the center of town and looked to be a very nice place to tie up at $1.40 a foot, free showers, and coin laundry. There are a few restaurants in town, a multitude of churches, a post office, police station, and a few different stores. A nice place to stay, and the largest town on Long Island. Just south of town, we found a series of roads that seem to be set up to support a housing development of some kind. Perhaps the project is still underway, or possibly abandoned. Projects in the Bahamas seem to come and go, and aren’t necessarily always finished. Whether the project is still underway or not, the views from the hill were absolutely spectacular! You could see the ocean, a natural series of inlets, and another blue hole off to the left. It was simply gorgeous. We headed back to the boat as it was getting dark. The crossing was just miserable as the winds and the waves began to increase. I cannot even imagine what it would be like on the other side of the island. I’m glad we’re on the leeward side! The blue (brown) hole in Stella Maris. Snails on the ocean rocks. Kris and Spinny in the Blue Hole cave. Off to Long Island today. The wind was coming at us again, so it was motor all the way. I’m beginning to feel like we’re in a troller, not a sailboat! The sky was blue and the sea green. The day was a beautiful one! 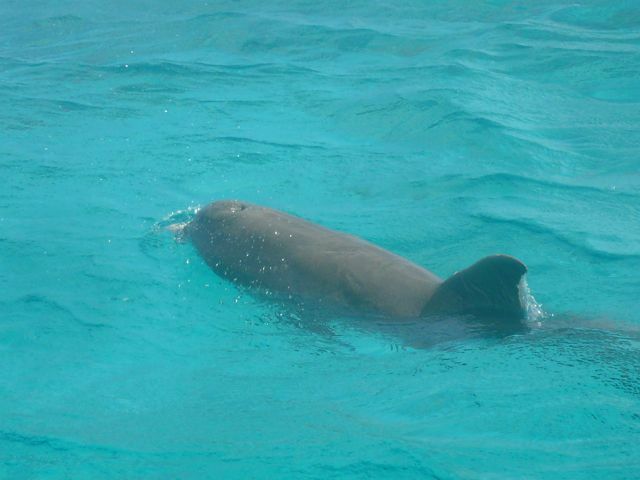 We even saw dolphins on the way, a rarer sighting here in the Bahamas then up along the U.S. east coast. Clouds were building up all along the horizon, evidence of the new front moving in. 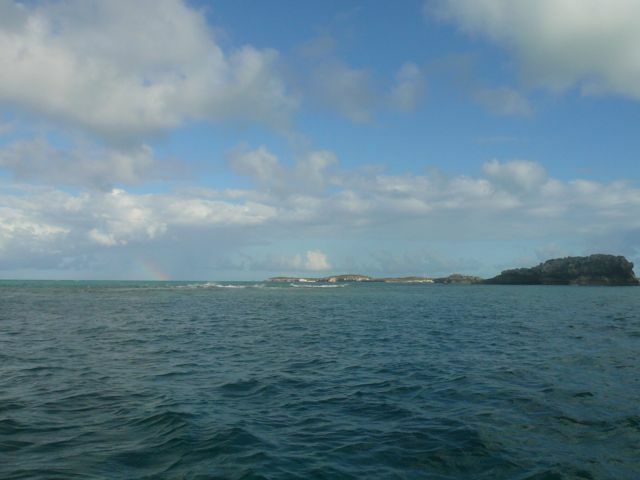 Because the water is shallower in this area, the clouds were tinted a faint greeny blue on the bottom, reflecting the light bounced off the sea below them. I enjoyed sitting out on the bow and watching the water disappear below me. 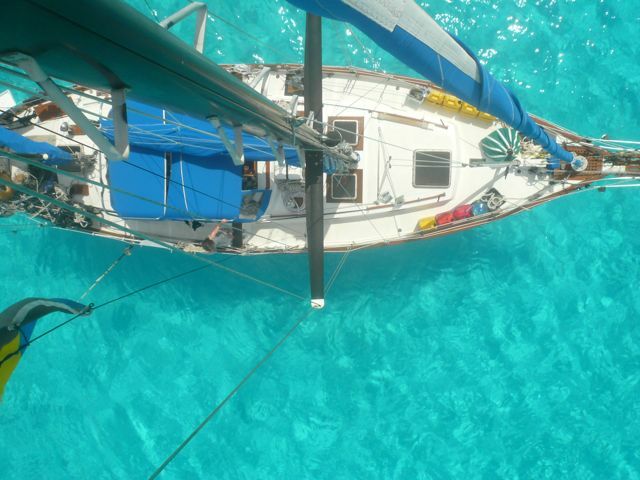 The water was so clear, I could see the starfish sitting on the sandy bottom wizz by as we sailed over. We anchored in Thompson Bay, Long Island. This seems to be a good holding and a well protected spot from the NE winds that will be roaring in. We’ll probably stay here for the next few days and explore Long Island in the meantime. It will be a nice change of pace.